There are 2 main ways to shave: with an electric or a manual razor. This usually depends on personal preference. It depends on which technique each shaver is more comfortable with. Many men simply start shaving in any random fashion, not thinking about the good/bad effects associated with each technique. Their only goal is to get he beard removed. In this article, we’re going to look at one of the more debated shaving methods, namely shaving against the grain. 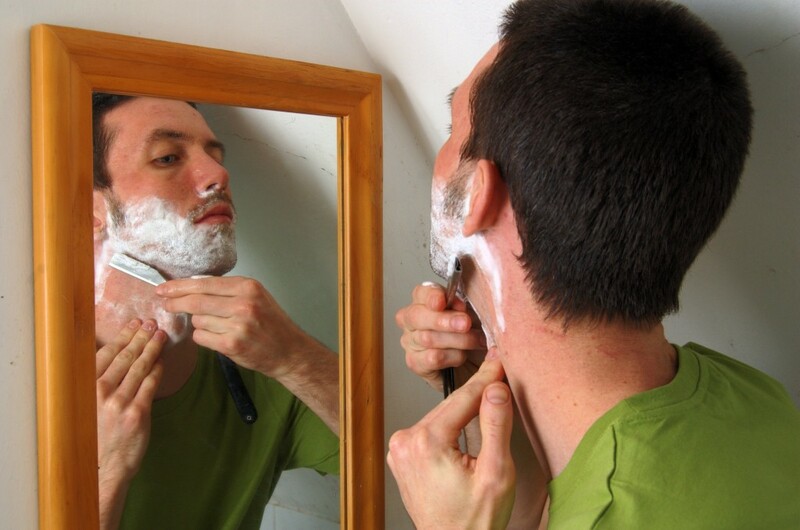 Most men choose wet shaving over electric (although many electric shavers can be used to wet shave as well), because they will get smoother results, on average. Wet shaving with a safety razor or a straight razor will usually go like this: you initially soak the brush in water and then mount the soap on top of it. You then either build the lather in a bowl or apply the soap directly to your face. Then by moving your hands over the beard, you can easily see the direction of your hair growth and start moving the razor in that direction at a proper angle. Wet shaving is very healthy for your skin and if done right, can be a better all around shaving experience. So why do some men opt to shave against the grain? Well, this method promises to give even a closer shave and even does so at a faster speed. So for men who probably wake up every morning and need to get a quick shave to before going to work, this may look like a shortcut to great results. However, its not like you save hours. The real question then is: is using this method to save maybe a couple of minutes or to get that extra closer shave worth it? Shaving against the grain will undoubtedly ensure a closer shave, but it also increases the risk of razor cuts, skin irritation and ingrown hairs. Shaving against the grain will pull the hair more harshly from the skin. Some men assume this risk because it helps them shave the hair closer to the skin. However, shaving against the grain is a very dangerous way of getting a closer shave. When the hair is pulled out harshly, it increases the chances of getting ingrown hair. So even though there are certain benefits associated with this method, there are some aspects that you can’t ignore. How else can I get a closer shave? Well, shaving in the direction of your hair growth provides a close enough shave, given the right tools and the right ritual. To better the experience, you should take a hot shower before shaving. The heat and steam will cause the pores to open up resulting in an even better shave. Another trick that you can use to increase the chances of a super-close shave is to use a pre-shave exfoliant. It will remove all the dead skin cells making it easier for the blade to cut closer to to the skin. But don’t go overboard with using pre-shave exfoliant because most are not for daily use. If you want to use one daily, then make sure to pick one assigned for that purpose. A combination of hot shower and pre-shave exfoliant will significantly raise the chances of getting the closest possible shave. Avoiding to shave against the grain will, on the other hand, greatly reduce the chances of getting razor cuts/burns. However, also while wet shaving, take certain precautions to avoid razor burns. Always use a clean razor and rinse it after every stroke. Splashing cold water over the skin, after the shave, is always advisable as it reduces irritation. Shaving with the grain may not provide a faster route to the closer shave, but it is undoubtedly the better, healthier and more comfortable method of shaving.